I have been dreading writing this post, because it means I have to make a decision. Last year I wrote a blog post exploring a book I had just read about family dialogue journals (FDJs). To sum it up, FDJs are notebooks that travel between school and a student’s home on a regular basis. 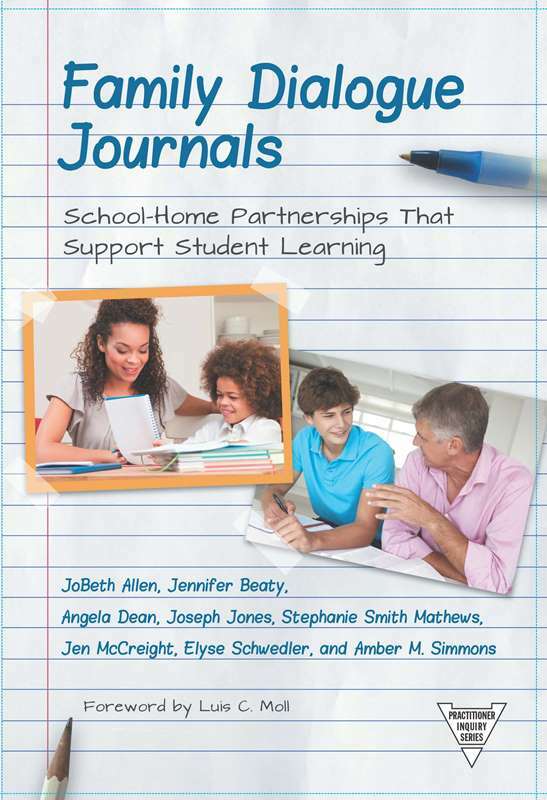 Family dialogue journals attempt to build a partnership between home and the classroom. Students compose a brief letter about something (for instance reflections on what’s going on in class or specific aspects of a curriculum), someone at home replies, and then the teacher responds to both student and family member. The sequence ends when students share their FDJs with each other. The cycle then repeats every 1-2 weeks. I first became interested in family dialogue journals after I removed grades from my classroom. Regardless of how effectively grades communicate learning, they are a school’s primary method of communicating student progress to parents and family members. If I was going to do away with grading, I realized that I had to put some mechanism in place to keep families informed of what was going on in their child’s English class. I also saw in FDJs a way not only to connect the classroom to the family, but to welcome families into the curriculum. The constant rush for globalized learning has a tendency to erase the power of the local. Our roots, our complex histories, and our shared struggles can be pushed aside when we keep our eyes trained on place-agnostic learning outcomes. With these potential benefits in mind, I decided to give FDJs a shot. During my first read of the book, I remember being struck by just how often the authors referenced the difficulty of the FDJ process. Almost every chapter reminded the reader of the challenges involved with the project. Finding time for students to share in class, creating student buy-in, responding to every journal, and working through language issues were just a few of the points the book raised. I now understand. I struggled more with sustaining the family dialogue journals than perhaps any other aspect of my class. By the end of the school year only approximately 1/3rd of each class was turning in their FDJs. At first I took this as a sign that students weren’t enjoying them. But after speaking with every class multiple times throughout the year, I realized this wasn’t true. In fact, students loved listening to their peers talk about their families. They just felt uncomfortable asking their family members to do them. I get this. Throughout the year I modeled the process by undertaking a family dialogue journal with my mom. Even as a 34 year old adult I sometimes felt a little hesitant asking her to complete the next entry. Sometimes I would forget until the last moment, compounding my sheepishness. The FDJ requires more of a family member than typical homework assignments. Indeed, a few students in each class had no qualms repeating disparaging comments made by their family members about the FDJ. And again, I understand. The family dialogue journal places demands on everyone. Although I enjoyed reading them, sitting down and replying to forty notebooks every two weeks was time consuming. There were times when I was relieved that so few students turned them in. Listening to students share their entries with the class was a joy, as was responding to each entry. Some parents talked about their childhoods, describing a time they skipped school to hear a concert or attend a protest. Others detailed humorous anecdotes about their children parading down the sidewalk wearing nothing but a diaper and saran wrap. Many families allowed me a glimpse into their lives. But not all did. Some offered me only random sentences here and there, inconsistent descriptions of inconsequential things. That’s part of the process. Meeting every family where they’re comfortable and then trying to build something of value. There can be no judgement in a family dialogue journal. I’ve been on the fence all summer about returning to the family dialogue journal. I was steering towards dropping them until a parent reached out to me during the end of August. The parent’s fortuitous email explained how powerful the journal was, and that it had deepened the family’s relationships with one another. The parent included photographs of the letters her son had continued writing to his collegiate sisters throughout the summer. This is the power of the FDJ. If handled unevenly (like I did last year), it’s just another school related nuisance to be suffered through by kids and families alike. But with the right combination of ingredients, it has the ability to build wonderful connections. Through the FDJ, teachers, students, and families can honor and build upon local funds of knowledge. Students can learn surprising things about themselves and each other. In I-Writing: The Politics and Practices of Teaching First-Person Writing, Karen Surman Paley explores the powerful ways a student’s family shapes his or her social, political, and emotional identities. For Paley, first-person writing (like the kind encouraged by the family dialogue journal) is an effective way to engage with the larger issues of the day. With this (and a year of experience) in mind, I plan on making a return to FDJs this school year. Some things I know to improve (a stronger roll-out in the beginning of the year, talking them up during back to school night and then contacting any family who isn’t able to attend) while others remain murky (using the FDJ to have students discuss literary curriculum). In some respects family dialogue journals are the antithesis of standardization. They exist in a dialogic space between multiple parties and negotiated purposes. Anything worth doing is worth doing well. FDJs require time, patience, and communal effort, things in short supply for most of us working in the classroom. I look forward to writing another post about my progress in a couple months. What follows is an overview of my day from March 2nd, 2016. The impetus for this post came from my constant amazement at just how busy I (and every other teacher I know) appear to be pretty much all the time. I’ve decided to break it down roughly by school period. I’ve removed any and all identifying markers to specific students and/or adults without sacrificing the spirit of what transpired on March 2, 2016. See part 1 here, part 2 here, part 3 here, and part 4 here. Besides lunch, 4th period is the only time of my day when I’m not actively engaged with children or adults. It’s the only part of the day when I can try to work through my considerable ‘to do’ list. My district gives me two forty-five minute planning periods a day. Various mandatory meetings eat up one of periods every day of the week except Thursday. My school’s Special Education department uses Thursdays to hold IEP meetings, legally required meetings where parents, teachers, and students get together to monitor and discuss any child receiving special education services or accommodations. As soon as Mr. Carter (my team’s excellent math teacher) leaves the room, I try and get to work. My energy is already flagging a little, so I allow myself a minute to just sort of stare into space. We’re between periods and the hallway outside my room is packet with children. I smile and wave at a few of them while I slump down into my chair. I look over at my clipboard and see “RESPOND TO FDJs” written in angry, giant red letters. Every day I keep a running list of the things I have to do. The longer an item stays on the list without being completed the larger I write it. I’ve put this one off a few days, so that’s where I decide start. A Family Dialogue Journal (FDJ) is a notebook that goes home with each student every two weeks. Students use the journal to write short letters to their families about what they’re reading, writing, and thinking about in English class. Then, the parents read the letter and compose a reply. When the journal comes back to class, I read and comment on what the student and family member wrote. The cycle concludes when students share their responses with the class and ideally everyone discusses similarities, differences, etc. Although an immense time sink, I’m committed to FDJs as a form of communication. One of the first things I realized when I removed grades and tests from my classroom last year was just how important numbers and letters were for teacher-parent communication. I needed to find a way to a) let each parent know what we were doing in class and b) how their child was progressing. I experimented last year with a variety of methods but nothing stuck. Over the summer I stumbled across a book on Family Dialogue Journals (Here’s a quick summary on the book if you’re interested). I decided to give them a shot this year. The book was upfront about the difficulty of implementing FDJs in the classroom. Time, diverse language populations, and trust are just a few of the challenges. The FDJ process asks kids to be vulnerable and reveal aspects of themselves that schools typically have no interest in. The benefits, however, can be powerful. Through the Family Dialogue Journal process, teachers are able to value and incorporate the diverse range of local knowledge represented in each classroom. Students and families may reveal things about themselves and their histories that I have no other way of accessing. This year’s trial run has been challenging. I’ve run into every problem suggested by the authors and then some. Although his response only briefly touches upon the kid’s question, I love reading it. These are the type of FDJs it’s easy to respond to. I skim back through the pages. The kid gets my annotations (Great question! What do you think the reason is?) and the father gets his own letter (Thanks for sharing this. Did you and your wife decide on a consequence? If so, how’d it go?). Families rarely respond to my responses, but that’s an issue I’ll tackle next year. My focus this year is just getting families and students to complete the journals. The next FDJ comes from a family of similar socioeconomic background and education level as the previous kid. Despite this, the notebook I now open barely contains any writing at all. The girl’s letter home is a single sentence: ‘Dear ____ (she always leaves it blank because she doesn’t know who’s going to respond), how have you struggled?” Mom’s response is equally terse: “I struggle to meet deadlines.” Ironically, this parent told me she’s not satisfied with the amount of homework teachers assign her daughter. At our last parent-teacher conferences, she asked for extra writing practice so her daughter could improve her elaboration skills. Family Dialogue Journals offer interesting insight into family dynamics and the persistence of personality traits. There’s typically an inverse relationship between length of entry and the effort of my response. A longer entry, while requiring more time to read, is easy to respond to. There’s enough meat on the bones to produce some a genuine reaction from me. Although short letters, such as the one I’m currently holding, take very little time to read, I have to spend longer trying to tease out information. To the girl I write “Great question. What kinds of struggles do you see around your house? Was there any particular reason you asked this question? What are some ways you struggle? I’d love to hear more!”. The mom gets “Thanks for sharing. I know all about deadlines. I have to respond to these journals in a short amount of time. In fact, most of my job is about meeting ever shifting demands. Would you mind talking a little bit more about some of the deadlines you face at home? I appreciate you taking the time to do this.” The last sentence isn’t just for show; I mean it. 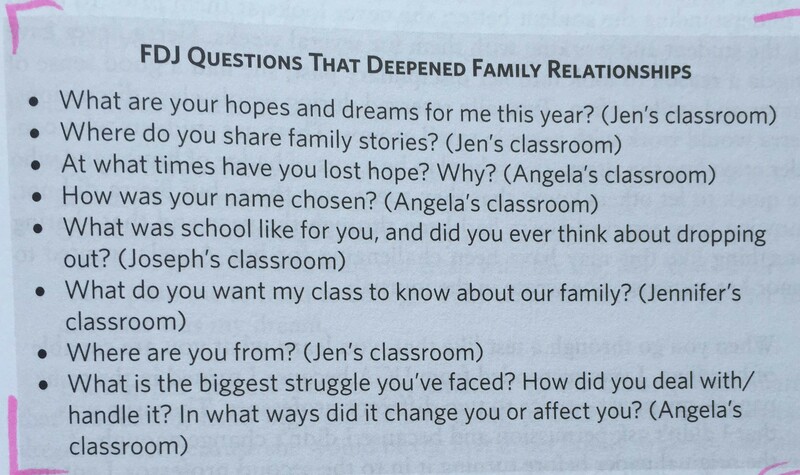 Family Dialogue Journals ask a lot of families. Most families, when able, rise to the challenge. And despite their reticence to share out loud, students claim to enjoy them. The next journal is in Spanish. Instead of looking for the rest of the FDJs written in Spanish, I embrace my ADHD, grab my the notebook and my laptop, and find a teacher who speaks Spanish. She translates it out loud as I type out her words on a Google Doc. The mom’s response describes a time teachers in her home country were protesting in the streets. I thank the translator and return to my room, where I type out a response, put it through Google Translate, print it out, and staple it into the journal. I manage to knock out four more FJDs before the bell rings. It’s now lunchtime, 11:24, with zero lessons planned and seven FDJs completed. Parent-teacher conferences can be jarring. Not because of supposed helicopter parents who want nothing more than to guarantee a successful future for their child. Not because of the families who are too busy working multiple jobs to come in. Parent-teacher conferences are frightening because of what they reveal how our culture views education and the purpose of schooling. What can he/she do better? What does he/she need to practice more at home? The last question, while perhaps not always explicitly mentioned, permeates the atmosphere of almost every parent-teacher conversation I’ve had. Fueled by legitimate class anxiety, families hurl themselves at teachers, feverish to extrapolate any piece of information that might benefit their children. The fear is palpable. How is his writing compared to his peers? Do you have any summer programs to recommend? I noticed she isn’t studying enough when she gets home; how can we remedy that? And we are too eager to comply. We come equipped with gradebooks open and lexile charts at the ready. We measure and diagnose and prescribe and remediate. We dissect children, cutting them into hunks of meat to be weighed on the scales of achievement. Scales that are designed to validate and propagate a singular vision of achievement. This vision denigrates anything that does not conform to the logic of production and instrumentalism, the belief that education is concerned with nothing more than means and ends. Means and ends that we accept acritically. I have children who are witty, generous, and kind. Kids who move quickly and kids who take five minutes just to take out a sheet of paper from their disheveled, overstuffed binders. Most of my students are in varying states of hormonal and neurochemical flux. They test boundaries, they try on new identities, and they struggle to develop a sense of values within a culture that either demonizes or fetishizes them. On any given day, getting most of them to read or write a few meaningful sentences is no small victory. Some are academically gifted. Most aren’t. And that’s okay. Because we all have different selves, different modes of existing in this world that cannot and should not be devalued by an ideology of technical knowledge. This brief post is neither anti-parent nor anti-teacher. It is about trying to figure out why parent-teacher conferences feel like so much wasted potential. About why I leave conference day feeling cheated and hoodwinked by the ecology I’ve devoted the majority of my adult life to. Discussions about quiz grades and late homework and how many zeroes a certain child has train our attention to only the most superficial aspects of a democratic education. The necessarily difficult conversations about why we’re doing what we’re doing in schools cannot occur under our current system. We should be able to meet and debate knowledge and purpose and what it means to exist within a community of others. I want to celebrate and value the ridiculously complex spectrum of human cognition, not willingly truncate what it means to be a dynamic living thing. TL;DR: A Family Dialogue Journal is a journal that travels back and forth between school and a student’s home. Teachers, students, and family members engage in a written dialogue about issues pertinent to both class and home life. I did away with grades in my middle school English classroom last year. The process of de-grading and de-testing brought with it a number of logistical and pedagogical challenges. How would parents know what their child was up to in English class? By removing grades I had removed the primary mechanism of keeping families involved in their child’s education. I needed a way to keep parents engaged without relying on letters or numbers. I attempted to create a system where students wrote to their families every day. Every lesson ended with five minutes of reflective writing on the day’s objective. What did they learn? What was the point? What components of the lesson did they find enjoyable? (This was before I read teacher scholar Joe Bower’s wonderful blog post questioning the dominant logic of writing down a fixed, measurable lesson outcome on the board every day.) While I thought the activity had its merits, my students hated it. They took every opportunity to let me know how they felt about it during our end-of-year portfolio conferences. I don’t blame them. Since I didn’t start until the third quarter, I hadn’t set a precedent or routine for the writing. I wasn’t able to have a vision for the writing, either. Without grades, every family would be left in the dark unless I found a way to somehow invite them into the class and engage with what their child was learning. I knew I had to improve my system for the upcoming school year. Family Dialogue Journals provides an excellent introduction into the world of family journaling. At its core, family journaling attempts to build classroom community by engaging teachers in written dialogue between students and their families. This post will provide a summary of the useful information in this excellent book. Chapter 1: Why Use Family Dialogue Journals? What is a Family Dialogue Journal (FDJ)? Although there isn’t a single “best practice” approach, every FDJ has at its core an ongoing written conversation between teacher, student, and family. With more and different skills required of students and teachers, parents need to know what their children are learning. FDJs provide a way to let parents really know and take part in their child’s learning. FDJs can act as as a two-way bridge, not only sharing information with families, but soliciting and incorporating family knowledge and into the curriculum. FDJs carry with them some ethical and logistical concerns. There is no single best approach to incorporating them or dealing with the myriad issues such communication can create. Different family schedules means some children might need to use a faculty member to write to instead of a parent. Opening up a space for dialogue means being prepared to handle whatever comes out. Be ready to read things that will throw you off guard. Have discussions with any child and family that pops up on your teacher radar for any reason. The second chapter explains how FDJs can serve a variety of purposes. For instance, they can be used to increase family participation, value family funds of knowledge, and incorporate critical thinking skills. The chapter discusses the importance of communicating the purpose and function of the FDJ to families from the start of the school year. The authors did this by writing home letters, speaking with families during school events, etc. Set a strong foundation to make sure everyone understands that the purpose of the FDJ is more than just busy work. Teachers should also communicate about the FDJs with administration to make sure everyone is on the same page. There’s no one way to schedule and facilitate FDJs in the classroom. Use journals on a one or two week cycle. 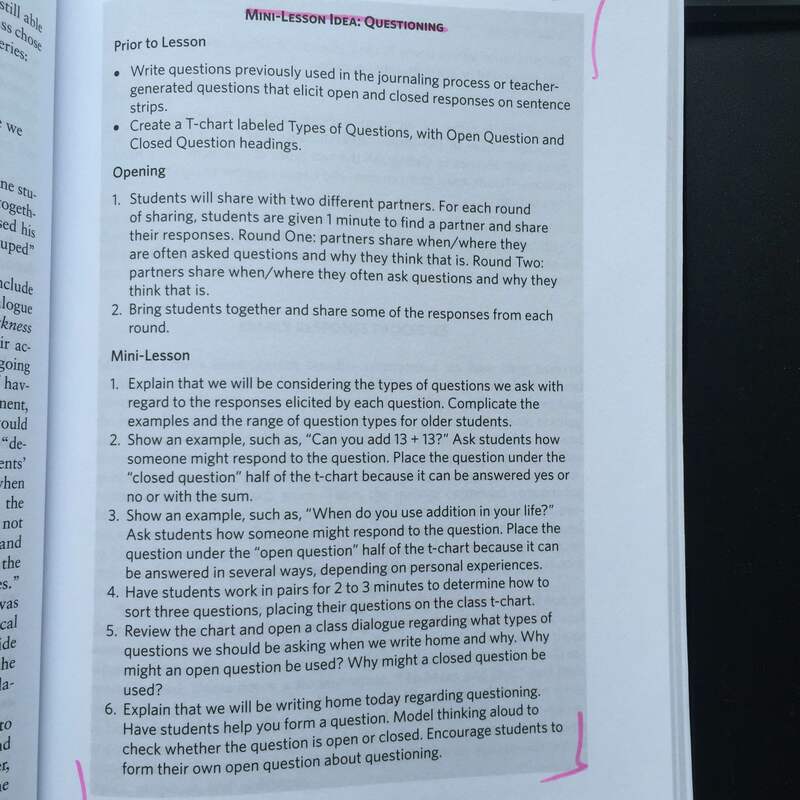 Create the questions yourself or allow students to come up with a few. Make sure to bring students into the problem-solving process if you see something not working. Sharing is equally flexible. A few students can share to the whole class each day. Students can share in small groups if time is an issue. After responding, a student can call on his or her peers to ask clarifying questions or to speak on a related topic. In terms of responding, try to write a few sentences in every FDJ every cycle. Be prepared for families to not always answer. Sometimes family responses will be short. It’s all part of the process. Flexibility is key. Generating effective questions requires constant collaboration and reflection by both teachers and students, especially during the beginning of the FDJ process. Teachers can use journal entries focus on literature. Incorporate the FDJ into whatever topics your students are reading about. Link the FDJ prompts to your essential questions and enduring understandings. Use the journal to help your students learn more about their family’s heritage. Creating effective, productive questions is an art. Help students learn this essential skill by teaching it and practicing it. The authors of the book required their students to take their FDJs home every Friday. They wrote to a variety of family members in and out of their primary residence: moms, dads, grandparents, siblings, uncles, aunts, etc. Be sure to have Google translate and/or any school linguistic resource on hand. Families should be allowed to respond to the FDJ in whatever method, language, and format works best for them. If the journal isn’t making it home or if you aren’t getting any responses, don’t be afraid to talk with the student to find out why. Make sure that you have effectively conveyed the function and expectation of the FDJ. Many families might not know what they’re supposed to do, or how they should go about doing it. Remember that this type of family communication will be as new for them (most likely) as it is for you! Sharing increases motivation for students to complete and return their FDJs. As mentioned above, sharing FDJs can come in many formats. Work together with students to develop sharing norms and spend time practicing them. Don’t just assume that this comes naturally. Think about creating mini-lessons on selecting the sharing order and how to ask and answer questions. Consider making group jobs like timekeeper and material manager. Stay in the moment and open to discussion on anything that comes up. It’s likely that your sharing processes will evolve with classroom needs and students’ input. Connectional curriculum (a term new to me) links classroom learning with families and communities. This doesn’t mean parents helping out with math homework or signing a reading log. Connectional curriculum grows from what we learn about each student’s family’s experiences, jobs, histories, and opinions. The authors also make a case for using FDJs as a vehicle for social-justice. This type of critical curriculum supports the questioning of dominant cultural practices while encouraging action on a wide variety of social topics. Use family knowledge to build community: students can learn about the history of their name, for instance, or find connections with the familial circumstances of other students. Connect curriculum to FDJ entries: What do you know/celebrate about Earth Day? Can you show me how you would solve 59 divided by 4? Where on the map did your family stories take place? Have you ever written poetry? Lastly, help students use their FDJs as a springboard for developing a critical lens. FDJs became a critical component of a dynamic classroom for each of the teachers involved in this book. Teachers were able to deepen relationships between every stakeholder in the education process. 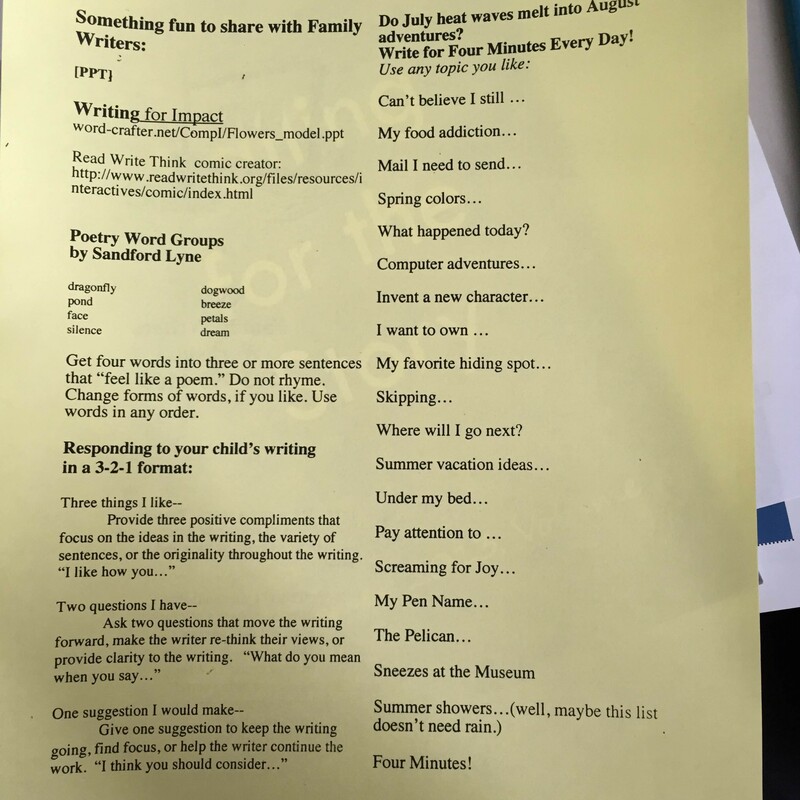 Families, administration, teachers, and students were all connected through intentional writing and sharing. The book ends with a few miscellaneous suggestions for incorporating the FDJs. I can’t wait to begin the FDJ process this September! Thanks for reading. Continuity Panel: What Can TCs Do? Today is a Continuity Panel. 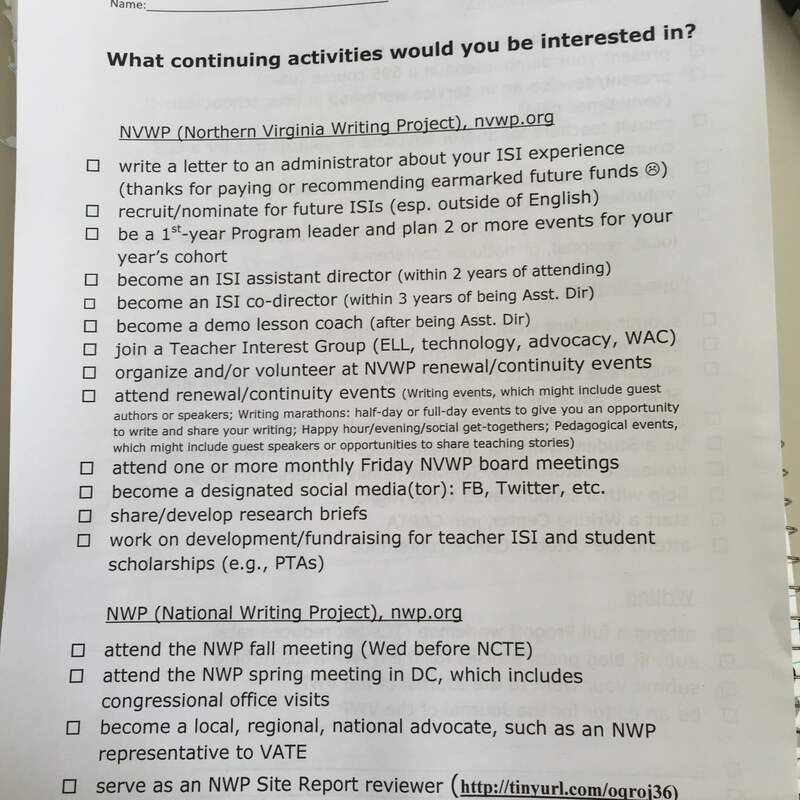 What can Writing Project Teacher Consultants do? Our Fearless Leader (OFL) hands out a double-sided sheet listing many of the activities and opportunities available to TCs. We’re now part of a group. A righteous posse. Not unlike Beecher’s missionary teachers of the 19th century, we’re charged with spreading the word of the power of writing. I’m operating from the stance that all teaching is political. It’s impossible to escape politics when working in a wide-spread institution that receives significant money from federal funds/tax payers. (See a previous post on politics and teaching from Amber.) In a political landscape when curricula is often tied to privately backed standards and privately created high-stakes testing, what a teacher covers in the classroom has power. Writing across the curriculum (using writing as tool for learning in every class). Writing in the discipline (writing as a historian in history class, writing as a scientist in science class). 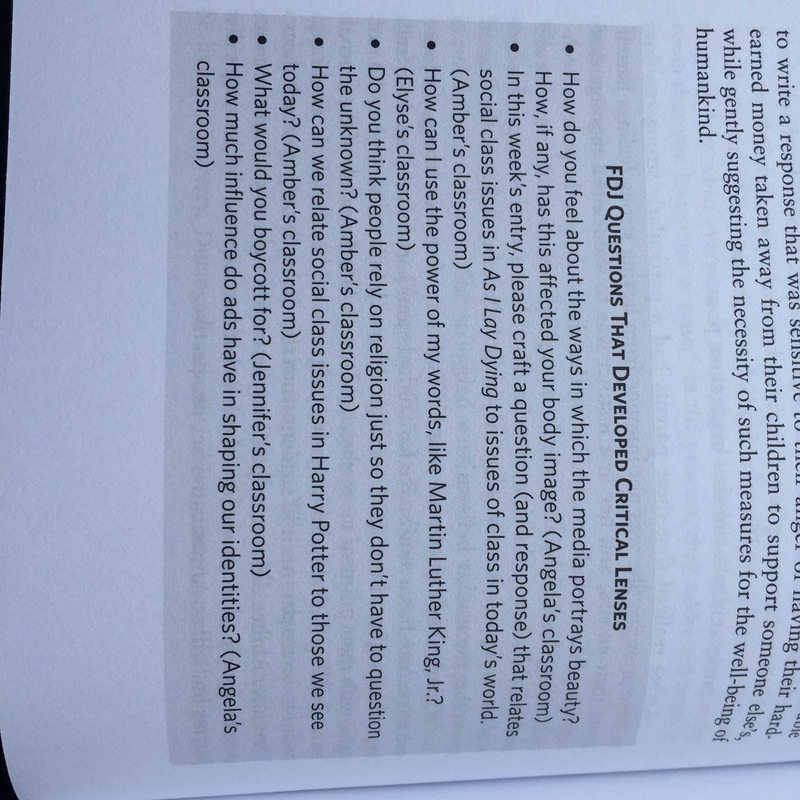 A recent issue of the NCTE’s middle school journal, Voices from the Middle, covered these topics in detail in their issue on Disciplinary literacy. 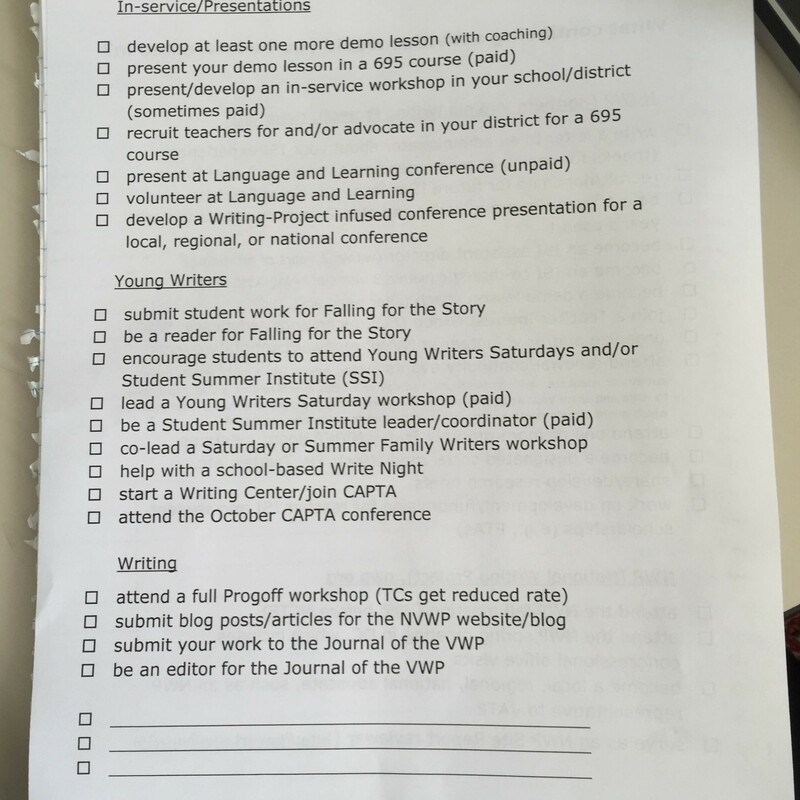 The Writing Project has various ladders and roles and responsibilities. Although there is an organizational flow-chart of sorts, the project is refreshingly non-hierarchical. We have a free-flowing discussion of all things NVWP/NWP related. Sorry I’m not blogging about this. The ideas are flying at such a rapid pace; it’s hard to nail down how to simplify and organize it for presentation. One of the themes of our talk is, ‘Say yes!’ To presentations, to invitations, to courageous conversations, to making yourself available and getting out of your comfort zone. The only way to get better at something is by doing it. We end by talking about how the Writing Project is also about raising the status of educators in this country. We work with students. We work with teachers. We work with administrators and counties and superintendents. Getting knowledge, getting paid to present that knowledge, and elevating the status of teachers (and therefore serving children better). Also, speaking of children, here’s a nice handout to offer families to help them converse with their child about writing. Visit our website! Join us!